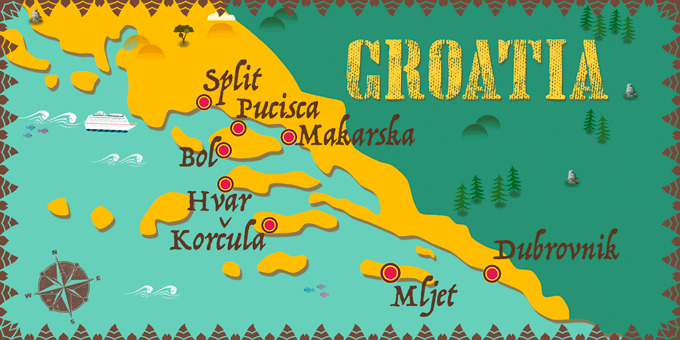 Discover the amazing culture and stunning coastline of Croatia on board of an exclusive cruise of 38 passengers. Explore the walled city of Dubrovnik and the natural haven of Mljet. Discover the abundant flora of idyllic Hvar and the Dalmatian Capital of Split. Let Pucisca and Makarska amaze you with their historic architecture and visit the birthplace of Marco Polo in Korcula. International flights: UK - Dubrovnik - UK. 7 Breakfasts, 6 Lunches & 1 Dinner. Transfers in an air-conditioned vehicle: Dubrovnik Airport - Port - Dubrovnik Airport. All air and port taxes & fuel surcharge. 7 nights accommodation on board the MS Apolon 5* (Standard Deck). Drinks: 1 bottle of water (0,5L), house wine (0,25L) and coffee or tea during meals on board. * You will have the possibility of purchasing travel insurance in the next step of the booking process. Entrances, drinks not mentioned, tips (€50/pax), or anything not mentioned in the price includes. Arrive at your UK departure airport, ready for a flight to Dubrovnik. Arrive in Dubrovnik, known for its atmospheric old-town and walled city. Transfer to the port to board the boat. Depending on the time, the rest of the day is at your leisure. Welcome Dinner and overnight on board. Breakfast and lunch on board. In the morning, depart to Mljet, arriving in the early afternoon. Mljet is a beautiful island, abundant in nature with rich flora and fauna and exceptional beauty. The main attraction of the island is its National Park two saltwater lakes: Malo Jezero and Veliko Jezero. In the centre of Veliko Jezero, there is a small islet that houses an old Benedictine monastery from the 12th century. Dock in Mjet and the rest of the day is at your leisure. Overnight stay on board. Breakfast and lunch on board. In the afternoon, anchor in Hvar, an island famed for its fields of lavender, rosemary, thyme and sage. In spring the aromas of these herbs can be smelt in the air. Hvar has a rich cultural and historical heritage, unique gastronomy, beautiful beaches and clear waters for swimming in. Spend the day at your leisure. Overnight stay on board. Breakfast and lunch on board. In the morning, arrive at Bol, one of the most beautiful destinations in the Adriatic. Its premier attraction is Zlatni Rat Beach, formed of golden pebbles with an immense coral reef. In the city, there is a Dominican monastery, numerous baroque mansions, and stone homes. In the afternoon, dock in Split, the capital of the Dalmatian region. Split has a long history, stretching back to the time of the Roman Emperor Diocletian. The city offers great examples of ancient architecture; Romanesque churches of the Middle Ages, Gothic palaces, Renaissance noble houses, baroque facades and modern architecture. Spend the remainder of the day at your leisure. Overnight stay on board. Breakfast and lunch on board. Arrive in Pucisca and spend the morning at your leisure. On the island of Brac, this peaceful city is known for its tradition of white stone masonry and pristine coastline. In the afternoon, arrive in Makarska, a cosmopolitan coastal city at the foot of the Biokovo mountain. The main attraction of the city is the Franciscan monastery founded by Bosnian monks in 1614. Spend the evening exploring at your leisure. Overnight stay on board. Breakfast and lunch on board. In the afternoon, anchor in Korcula, the birthplace of the famous traveller and merchant Marco Polo. The old walled city is often compared to Dubrovnik, although it is less crowded. Explore the narrow streets of the old town at your leisure and enjoy its exceptional architecture, from the majestic Baroque Gothic cathedral of San Marcos to the Venetian Palace Gabrielis. Overnight stay on board. Breakfast and lunch on board. In the early afternoon, arrive back in Dubrovnik, an impressive city and a UNESCO World Heritage Site. The ancient walls of Dubrovnik, the most striking of all the Adriatic, house architectural gems such as the Rector's Palace, the Franciscan monastery, the Dominican monastery and the cathedral. In addition to its historical heritage, Dubrovnik also offers visitors beautiful beaches, exquisite cuisine and rich cultural offerings. Spend the day exploring at your leisure. Overnight stay on board. Breakfast on board. Disembark and, at the indicated time, transfer to the airport for a flight back to the UK. Arrive in the UK and end your trip. 220 V. No adapter required. Once the reservation is made, any change in it will entail an additional charge of € 30 per change. - with more than 61 days before departure: 20% penalty. - between 60-46 days before: 50% penalty. - between 45-31 days before: 75% penalty. - less than 30 days before departure: 100% penalty. 7 nights accommodation on board the MS Apolon 5* (Main Deck).